I'm giving Clematis another go of it - this time in Downers in our new yard. Welp, actually, I'm giving it a go in a pot. With a trellis embedded into the back of the pot. In the photo above, you can see the vine as it was when I got it from Home Depot. 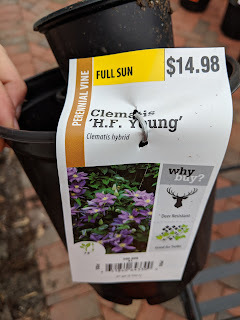 Below, you can see the tag that shows of the variety: Clematis H.F. Young. 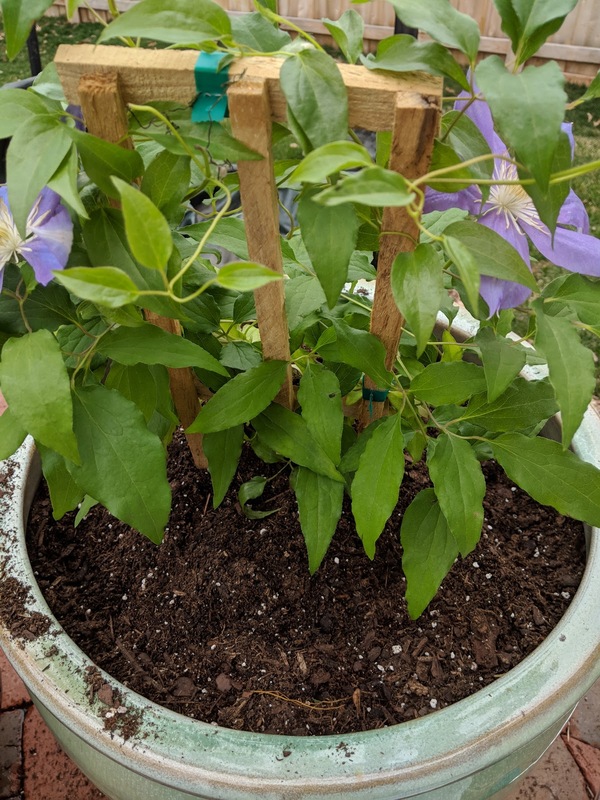 The photo above only shows the small trellis that came with the container, but you'll have to trust me here that the larger trellis is, indeed, in place. I grew Clematis in our old house in Elmhurst. Here is a photo from 2014 when one of our then three Clematis was taking off. I had planted the vines directly in the ground then, but this time, I'm trying a pot. Why? Because, I'm hoping that the trellis plus this climbing vine will provide some level of screening for our patio and give us a sense of privacy. I found this piece that provided some tips on the best way to grow Clematis in a container (hint...larger containers are better for winter!) Based on my history with these vines, this (like a lot of gardening with perennials) is an investment in the future. What I'll get in terms of growth upwards this year will be minimal. But, as the roots continue to establish themselves, next Spring, we'll see some significant coverage on the trellis and hopefully, by the end of next Summer, the privacy benefits will be meaningful. I'm thinking that I can also grow some hops vines (like I did in Elmhurst) in containers with poles that can provide some of the same, vine-y benefits.